No big new projects to report on this time, which is good since last year's burst of construction has left us with lots of finishing work to attend to. Here's a run-down on what we're working on as the year reaches the half-way point. The ground under the newly erected wood shop sloped about 18" from front to back, and that had to be filled in and compacted before we could look at pouring the concrete floor. 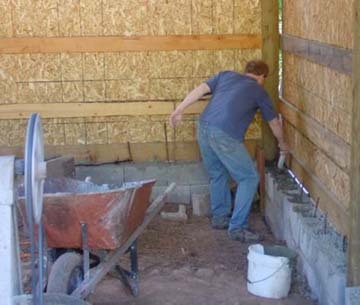 The first step of that process involved constructing a concrete-filled cinder block retaining wall to fill in between ground-level and the level that corresponds to the bottom of the yet-to-be-poured concrete slab. Setting the cinder blocks for the wall was straight-forward enough, but since the building needed eighty feet of retaining wall, it was no small task. Ron was kind enough to take that project on during his month's visit,and he did a fine job. Now, we're using the backhoe to bring in fill, and the wacker to tamp it down. This is a good time to get earth-moving chores done while the ground is dry enough to work, but not too dry. 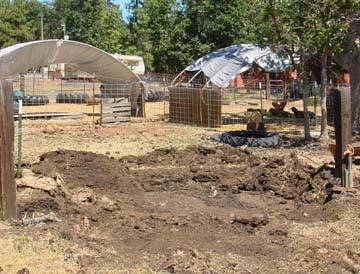 For example, after taking down some fencing around the main garden pen so that we could fell a dead tree, we wanted to use the opportunity to transfer some of the composted hay/manure mulch up to a terrace we're creating in front of the fifth wheel trailer. The long-term plan is to over-winter sheep in the main garden area; that way they enrich the soil with their manure and urine, and work it into the ground with their hooves thereby minimizing the chore of hauling manure. In practice, there's a tendancy for composted hay-manure to slid downhill and build up against the downhill fence so what we're doing in the picture is using the front-loader bucket on the backhoe to scrape up the excess and deliver it to the terrace. Our soil is high in clay; as the summer progresses, it dries out hard and the occasional summer rain just tends to run off downhill. 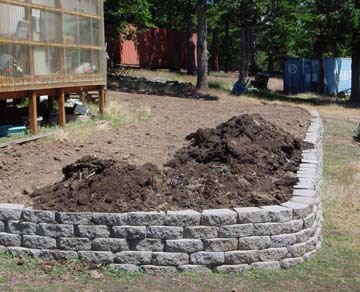 The composted hay and manure will help break up the clay and enable the terrace to accept and hold moisture. Throughout our early years, the fall months were marketed by a rush to get things ready for winter. All too soon, the snows would settle us in the for the winter, and after that it was no easy task to lay in more supplies. I'm pleased to note that those days are pretty much behind us as this year the 4th of July weekend finds us with the barn filled with hay and a shed stacked with more than a winter's wood. We'll keep adding to both as opportunity allows, but it's nice to be ahead of the game. Indeed, one of the great pleasures that this lifestyle affords involves being able to settle back on a winter's morning with a good book by a warm fire content in the knowledge that the pantry, shed and barn are all well stocked. It's a degree of satisfaction that is deeply meaningful. 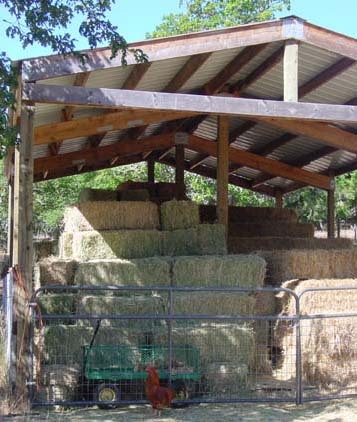 The full hay barn is especially pleasing since last fall was so dry that many of the people we buy hay from didn't have any to sell this year. Once we get the irrigation system up and running, our 20 acres of pasture will go a long way towards meeting the heavy nutritional needs of our ewes and does during the last stages of their pregnancy and while they're producing milk, but it's unlikely that we'll get to the point where we won't need to purchase at least some hay. For now, we've run conduit on the surface as we sort through the need to use "switches" to propagate the signal over long distances. For example, it's more than 500 feet from the satellite down to my place, a distance too great to go without an interim amplifier to boost the signal. For starters, we've just run the electrical conduit containing the Cat 5e wire on top of the ground. Because of the high clay content of our soil, once the ground dries out, it's just not cost effective to do the ditching needed to bury the conduit. Once the fall rains soften up the ground, we'll go back and bury the lines. At one point we had looked at using wifi to provide services campus-wide - and will no doubt look at it again as the available gear improves - but it's clear that at least for now there are some problems with going the wire-less route. For one thing, there's no line-of-sight that connects all of the housing. Most of our spaces lie in a circle with a 100 yd radius of the dining hall, but some housing is on the other side of a ridge that protects us from the prevailing winds - and we're probably going to have to use a land line to carry our intranet over the ridge. Another signal attenuating detail is that most of our housing is nestled into the oaks that we've carefully preserved around our site, and microwave signals don't pass through leaves very well. Some of the folks here have elected to sign up for satellite TV, and have had to get out there with the pole saw to trim a branch or two when new spring foliage blocked their signal. 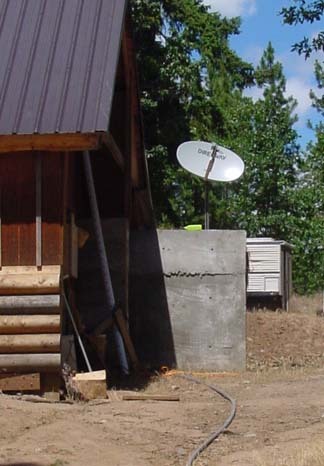 Most of the rest of us happily make-do with the over-the-air channels available from the UHF transmitter that sits atop a ridge overlooking The Dalles. That gives us the major networks, PBS, Fox and UPN for free, which is fine since we're not big on watching a lot of TV anyway. Our conditional use permit allows for the construction of eight two-story visitor cabins and two staff cabins. 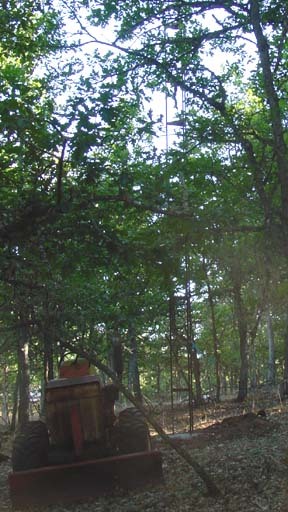 The hang up there is that visitor cabin sites One through Four are dug back into the ridge so that three-quarters of their bottom floors will be earth-sheltered. And, the downside of that is the way that the ridge blocks the signal from The Dalles. To get around that signal blockage, Ron, Paul and I installed a 20' tower in a location that offers a straight line-of-sight to the transmitter. We'll take the signal from that, and then amplify and distribute it to the four cabin sites that lack a view of the transmitter. It's been our experience that as people make the transition to this lifestyle, their interest in television falls off considerably, but having it available seems to provide a degree of transitional comfort early on while folks are adjusting to life in deep country. This spring we've also been putting effort into reorganizing our storage space. All told we've got a dozen shipping containers on site filled with all kinds of stuff that folks felt was worth bringing with them. We live in an age when people define themselves by their stuff, and having a secure place to keep their stuff here makes it easier for them to give Windward a try. If they decide that this actually is the lifestyle they want to pursue, then most of that stuff will be surplus; and if it turns out that this isn't for them, then they'll still have their stuff to use when they relocate somewhere else. A common pattern is that folks come here were already in transition because they didn't want to stay where they were, and after a bit of breath-catching and calming down, such folk will head on to their next adventure. Having had a chance to assess their real needs, they tend to shed their excess baggage with the result is that we wind up with containers filled with discarded personal stuff. Every so often, we go through and cull out the items that aren't likely to be of future use. After much delay, I decided to tackle the challenge of going through Bob1's container. One of our founding members, Bob1 had a heart attack and died in the fall of 2001. Since then, we've left his container as he left it, in part I guess because not going through his stuff was a way to not deal emotionally with the hole left by his passing, but it was clearly time to get on with the task. Much of the working gear was consolidated with other supplies and resources, and the most of the personal stuff went to the dump. 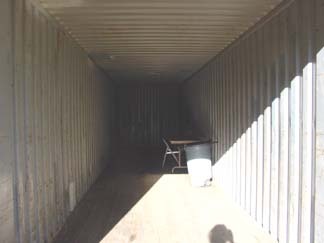 The final result was another container freed up for further use, which is a good thing, but it also marked the closing of a chapter in our history. And while I can't see that as a good thing, there's no doubt that it was a necessary thing. Life - and Windward - goes on.